Last week when GM was writing about the debate over Georgetown University’s Ten Year Plan, he mentioned that ultimately the best way to tackle the transportation challenges facing the university and the neighborhood would be for both parties to get behind the effort to bring a Metro stop to Georgetown. This comment led a reader to write to GM and ask what the status of that effort is. Rather than just answer that question, GM thought he’d take this opportunity to write about all he knows about a Metro stop in Georgetown: why we don’t have one and why we may yet get one (eventually). 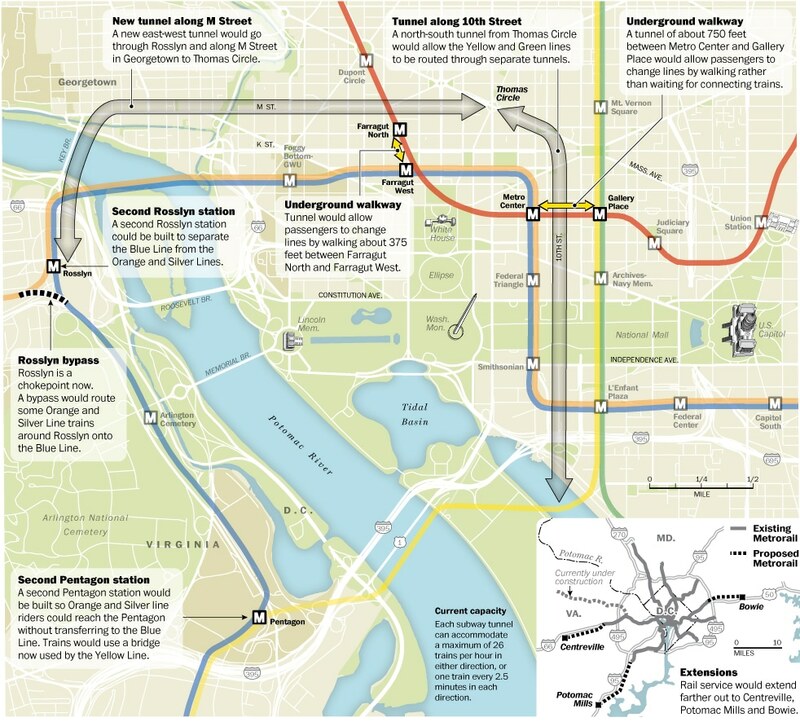 As rigorously documented in Zachary Schrag’s Great Society Subway, the planners behind Metro simply never seriously considered putting a station in Georgetown. The reason: the Potomac. To get under the river, the Metro tunnel has to start heading down far enough away so that it’s not like a roller-coaster. Commercial Georgetown is very close to the river and on a steep hill, which wouldn’t give the tunnel much distance to reemerge from underneath the river. Thus a Georgetown station would be extremely deep. It would be physically possible to build, but it would be extremely expensive. And the Metro planners didn’t see a reason to spend that sort of money on Georgetown. In the 1960s when the plans were developed, Georgetown had little office space and few apartment buildings. It simply was not a destination of suburban commuters. Since that was the audience for which the Metro was primary designed to serve, Georgetown was not considered a worthwhile station location. That’s it. No matter how affirming of all the stereotypes of Georgetowners the myth is, it’s absolutely false.